One of the most fun parts of being a publisher is working with incredibly talented designers. I love the visual and tactile elements of bookmaking. In my first publishing job, I worked in a very small, very fine independent publishing house where, in addition to answering the phone and reading the slush pile, I sometimes got to design book interiors and jackets. I'm not sure I have ever enjoyed my work more than I did then. I don't design books any more, because we have a highly experienced creative director who does it full time, and can call on gifted freelance designers. But I can still muse for hours over whether Janson or Baskerville is a more appropriate typeface for a new biography we're about to publish. One of the highlights of any season, for me, is when our creative director (formerly Amy King, now Patti Ratchford) brings in the jacket comps for the upcoming list. Going into one of those meetings I always feel like a kid coming downstairs to look under the Christmas tree. You don't know what you're going to see but you know there's going to be something great. I'll usually talk to our creative director about a direction for the design of a given jacket, and sometimes we'll talk about specific images or an author may supply some. And on a very few occasions I'll make specific suggestions about how I want a jacket to look. But I have learned it's usually a lot better not to micromanage designers and instead to let them come up with treatments on their own. What's remarkable to me--since as an editor I usually think I know the work more intimately than a designer can--is how often they will create a jacket that I would never have dreamed of, yet suits the book perfectly. Every once in a while--maybe one time out of five or ten--you get a design that just doesn't work and have to go back to the drawing board. Sometimes it's because the designer just doesn't "get" that title. Very often, if the designer is having trouble with the jacket, it's a sign that the editor or publisher haven't positioned the book clearly enough. Is it a coming of age novel that happens to be set in India, or a gritty portrait of the slums of Mumbai? Is it a history of American foreign policy since 2001, or an argument that we should play a different role in the world? If the editor hasn't figured that out, the designer is going to have a hard time nailing the jacket. On the other hand, I have sometimes seen our designers create jackets that made a book look more interesting than I thought it was when I heard about it in a launch meeting. Could it be that my colleagues sometimes think that about my titles? I'd prefer not to dwell on that possibility. It occurs to me that as I write this that I should post some examples of beautiful Bloomsbury Press jackets. I'll do that a bit later on. What got me started on this train of thought was a Wall Street Journal slideshow of nifty new covers for some classic Nabokov titles. I suspect designers enjoy a commission like this, because when the title is a classic, it's already "branded": you don't have to worry so much about conveying what's inside and have more visual freedom. 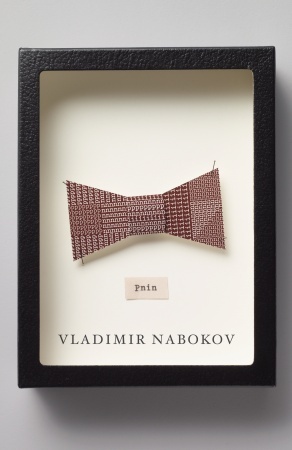 In this series of reissues, nodding to Nabokov's interest in butterflies, each one is designed as a specimen box. They are all distinctive and witty; I think my favorite is Carin Goldberg's understated cover for Pnin, above. Update: William Drenttel has pointed out that all 18 covers in the Nabokov set were first published on Design Observer. I should have given a hat tip to John Gall, art director for the series, who talks about the project there. Since you cannot access the WSJ link on this post without being a subscriber, I thought this was helpful to your readers. William, many thanks for the clarification and the link. My WSJ link worked without being logged in but I'm happy to direct readers to the excellent Design Observer blog.